1. I am aware that Brent Pourciau is not a medical doctor and is not qualified to determine a participant's physical capability to engage in strenuous exercise. 2. Medical clearance from my physician may be required prior to participation in any exercise program and/or engaging in any of the exercises contained within this program. FOR BEING ALLOWED TO UTILIZE THE INFORMATION IN THIS PRODUCT, I AGREE THAT I WILL ASSUME THE RISK AND FULL RESPONSIBILITY FOR DETERMINING THE NEED FOR MEDICAL CLEARANCE FROM MY PHYSICIAN AND OBTAINING SUCH CLEARANCE, THE SAFETY AND/OR EFFICACY OF ANY EXERCISE PROGRAM RECOMMENDED TO ME, AND ANY AND ALL INJURIES, LOSSES, OR DAMAGES, WHICH MIGHT OCCUR TO ME AND / OR TO MY FAMILY WHILE UTILIZING THE INFORMATION IN THIS PRODUCT AND TO THE MAXIMUM EXTENT ALLOWED BY LAW I AGREE TO WAIVE AND RELEASE ANY AND ALL CLAIMS, SUITS, OR RELATED CAUSES OF ACTION AGAINST BRENT POURCIAU OR AFFILIATES (COLLECTIVELY BRENT POURCIAU), FOR INJURY, LOSS, DEATH, COSTS OR OTHER DAMAGES TO ME, MY HEIRS OR ASSIGNS, WHILE UTILIZING ALL THE INFORMATION OR PARTAKING IN THE EXERCISES CONTAINED WITHIN THIS PRODUCT. I FURTHER AGREE TO RELEASE, INDEMNIFY AND HOLD BRENT POURCIAU FROM ANY LIABILITY WHATSOEVER FOR FUTURE CLAIMS PRESENTED BY MY CHILDREN FOR ANY INJURIES, LOSSES OR DAMAGES. Strength training for all sports involves a potential risk for serious injury. The techniques discussed and utilized in this program are being demonstrated by highly trained professionals. No one should attempt any of these techniques without proper personal instruction from trained instructors. Anyone who attempts any of these techniques, under supervision or not, assumes all risks. Brent Pourciau, TopVelocity.net, nor any partners of Brent Pourciau shall not be liable to anyone for use of any of these exercises, drills or instructions. 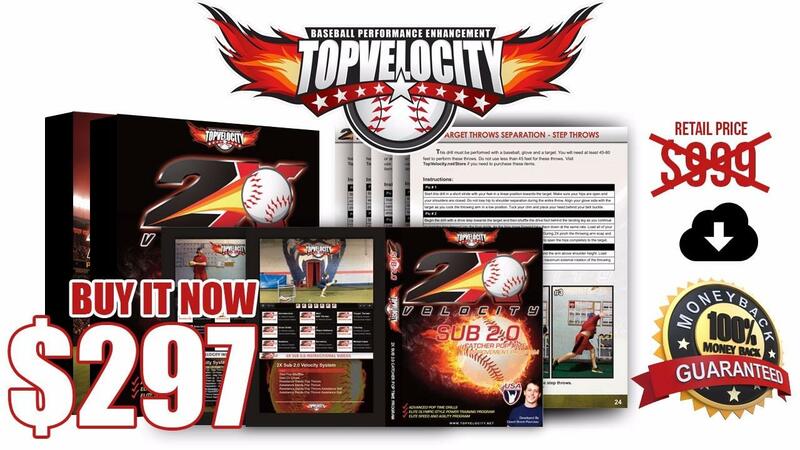 The Top Velocity Programs and TopVelocity.net is informational only. The data and information contained herein are based upon information from various published as well as unpublished sources and merely represents training, strength and conditioning and pitching velocity development literature and practice as summarized by the author and editor. The publisher of this manual makes no warranties, expressed or implied, regarding the currency, completeness or scientific accuracy of this information, nor does it warrant the fitness of the information for any particular purpose. This summary of information from unpublished sources, books, research journals and articles is not intended to replace the advice or attention of health care professionals. It is not intended to direct their behavior or replace their independent professional judgment. If you have a problem with your health, or before you embark on any health, fitness or sports training programs, seek clearance from a qualified health care professional. Copyright © 2018-2019 TopVelocity.net. All Rights Reserved. No part of this information may be reproduced or utilized in any form or by any means, electronic or mechanical, including photocopying, recording, distributing, or by any information storage or retrieval system, without permission in writing from the author. The authors and publisher disclaim any responsibility for any adverse effects or consequences from the misapplication or injudicious use of the information presented in this text. Inquiries should be addressed to Brent Pourciau, Webmaster, 17588 Hard Hat Dr, Covington, LA, 70435, USA. Purchase NOW to start developing a Sub 2.0 Pop Time! 3 Calendar System; Pop Time Velocity training, Olympic Based Strength and Conditioning, Anaerobic Conditioning. Call TopVelocity 985-249-9508 NOW with any questions or concerns!